Carol Bertha Arnold Ferrero, age 83 of Ferndale, passed away Tuesday, March 26, 2019. She was born on November 18, 1935 to Edwin and Bernice Arnold. Edwin was a well-known trombonist who performed in many area bands and clubs, later giving up his trombone to take a more stable job as Music Librarian at WWJ. Bernice studied to become an elementary school teacher and put her education to good use home-schooling Carol at times when she was ill. Carol grew up on Fairfield Avenue in Detroit and has one younger sister, Gretchen, who she loved very much. As a child, Carol loved reading and music. When she was in elementary school, she played the violin. Later, in High School, she took up the Harp and became head harpist. Carol also sang in the choir and learned to play the piano along the way. She attended elementary and middle school in Detroit, ultimately graduating at the top of her class from Cass Tech High School. Carol obtained a Bachelor’s degree in German from Wayne State University and spent her junior year studying abroad in Munich. She went on to obtain a Master’s degree from the University of Michigan in Library Sciences and Foreign Language. Carol spoke multiple languages fluently. Carol was introduced to Harvey Ferrero by some mutual friends who set them up. She later married Harvey with whom she was married to for 56 years. Both Carol and Harvey shared a love of music, architecture and art. These shared interests led to a strong and fulfilling marriage which provided a solid foundation for their three children: Paul, Carla and Lara. Carol started out as a Librarian for the Detroit Public Library and went on to become head of foreign language at the downtown branch. Later she became Branch Manager for two neighborhood libraries in the city. Carol spearheaded efforts to save the branches which, at the time, were suffering from declining funds. Her efforts to make them an integral part of the community created an environment that would become a safe and enriching place for neighborhood families. She was awarded the Walter H. Kaiser Memorial Award for her contribution to the improvement of Michigan Libraries. 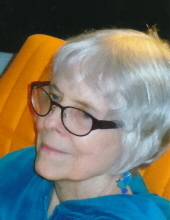 In addition to her career as a Librarian, Carol loved music and singing and spent most of her life performing as a contralto and vocal soloist in Church Choirs and the Kenneth Jewell Chorale. She also taught voice lessons out of her home. As a child, she enjoyed family trips to the Upper Peninsula where her family had a cabin on Gratiot Lake near the birthplace of her parents. As an adult, with her husband and three children, Carol took many long driving trips throughout the United States seeing much of the country and visiting many National Parks – her favorite. Carol had a wonderful, corny sense of humor which she inherited from her father and carried with her until the very end of her life. She found her greatest joy from the simple beauty of this world. Carol is survived by her husband, Harvey and their three children and their spouses Paul (Melissa) Ferrero, Carla (Scott) Leo and Lara (Bret) De Young. She has five grandchildren: Katarina, Danielle, Francesca, Jonathan and Lily. Carol is also survived by her sister Gretchen MacDonald, nephew James and niece Jean and their families and her Sister-in-Law Marian Ferrero. The family will receive friends Sunday from 1 PM until 6 PM at the Sawyer-Fuller Funeral Home, 2125 12 Mile Road, Berkley (two blocks west of Woodward Avenue). Memorial service will be Monday 11 AM at the First Presbyterian Church of Birmingham, 1669 West Maple Road, Birmingham. In lieu of flowers, memorial contributions may be made to the Parkinson’s Foundation. To send flowers or a remembrance gift to the family of Carol Bertha Ferrero, please visit our Tribute Store. "Email Address" would like to share the life celebration of Carol Bertha Ferrero. Click on the "link" to go to share a favorite memory or leave a condolence message for the family.